National research has identified a significant link between education and health. High school graduates live longer, healthier lives than dropouts. College graduates have even longer life spans, better access to health care, better dietary and health practices, and overall better health. Unfortunately, about a quarter of California counties have high school dropout rates close to 20 percent or more, including Los Angeles at 17 percent. While there are numerous factors contributing to the dropout rate, one third of female dropouts say that pregnancy or becoming a parent played a role in their decision to leave school. Girls most at risk for teen pregnancy are Latinas from low income communities. There is critical need for education and support services to reach these adolescent girls at the greatest risk for pregnancy and subsequent dropout before they get pregnant, ultimately breaking the cycle of teenage pregnancy. With this information, National Health Foundation has implemented the Go Harold’s Way; Be a STAR (Successful Teens Acting Responsibly) Girls Program. Goals of this program include reducing the incidence of pregnancy, improving high school graduation/completion and connecting participants to health and social services and resources in their community. Since its implementation, NHF has provided more than 700 students with the tools and education they need to prevent unwanted pregnancies and abilities to make healthy life choices. Haydee and Yvonne are two participants of the Be a STAR Girls program at Ramona High School and are set to graduate in 2018. For Haydee, the program gave her key information she did not have access to beforehand, “I learned there’s many ways to prevent pregnancy and learned all the parts of the female anatomy and what they do. 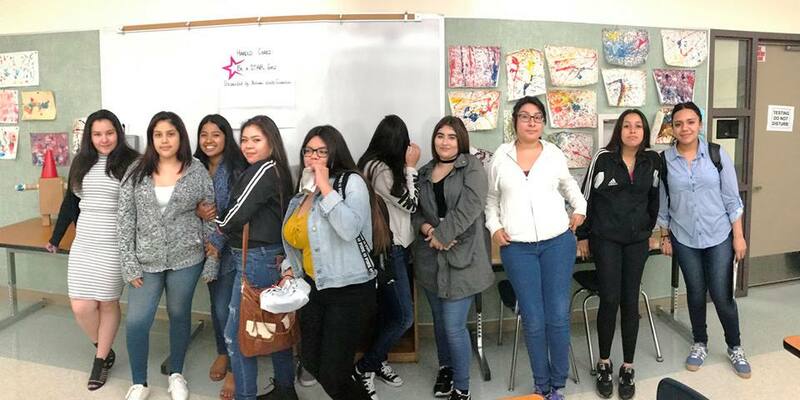 I feel confident about my reproductive health because I’m more informed about different topics that we learned in class.” The weekly topics touched on birth control and STDs as well as how to plan for the future. Yvonne admitted that before being in the program, ‘ditching school’ was a chronic issue. “Before coming to Ramona I was ditching a lot of school and now I come to class every day and will graduate next year. My plans after graduating school are to get a job and go to community college to help me have a career later in life.” In addition to committing to her future, Yvonne has a deeper appreciation for her body and her health, “In the Be a STAR class we got to talk about our physical bodies and how a woman’s body looks on the inside. We also lean to be more confident about our bodies. I now know how to protect myself from getting an STD.”When not in school Yvonne enjoys playing basketball with friends while Haydee likes to try new things. Both students have expressed that this program has given them the confidence to be able to make healthy decisions when it comes to their reproductive health. After graduation, both Haydee and Yvonne plan to attend community college laying the path for their future careers.